Vintage drag racing will continue to be a staple at Byron Dragway in 2019 with the newly announced "Glory Days at Byron Dragway" vintage drag race, car show, and swap meet scheduled for July 19-21, 2019. Glory Days at Byron Dragway will replace the wildly popular Meltdown Drags which celebrated it's ninth running in 2018. "We cannot thank our friends at Meltdown Drags Association enough for everything they've done for vintage drag racers and race fans," said Byron Dragway General Manager, Randy Simpson. "Glory Days at Byron Dragway picks up where Meltdown Drags left off and continues the tradition of authentic, world class vintage drag racing." Glory Days will embody many of the same qualities that made Meltdown Drags great but also be more inclusive by expanding beyond 1966 and older vehicles. Specific criteria will be announced in a forthcoming release. Registration will open at midnight on Wednesday, January 2, 2019. Entries will be limited to the first 500 vehicles that meet criteria. 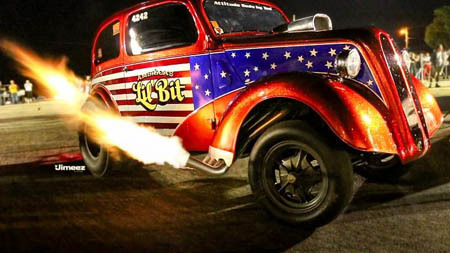 In addition to Glory Days, Byron Dragway will continue hosting the Second Annual Uncle Sam's Pie Eating Contest, another vintage drag race from the creators of Meltdown Drags, in June 2019. It's the end of the Meltdown Drags as we know it. Back in 2010 the stars aligned and the Meltdown Drags was born from an idea conceived in Koop's basement 5 years previously. We just wanted a fun place to race our vintage cars; hence the term we coined "vintage drag meet". The Meltdown was the first event of its kind, with strict criteria. Our goal was simple, to get old race cars out of the sheds & barns, and back onto the racetrack for everyone to appreciate and create a real 60's style drag meet. That was it, oh and to have the most fun of our lives. The best thing that came out of it was the friends we made. As it grew, so did the amount of time and people it took to manage it. As you all know, this event has become more work than fun for the crew. As a result, we have decided to take a step back and not have the Meltdown Drags in 2019. We are not going away and we are not disbanding. We're just going to focus on building cars, racing them with many of you and having fun! Just remember that the future is not written.